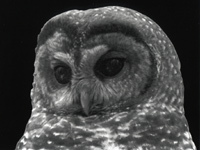 The God Squad investigates the controversial Endangered Species Committee proceedings over the Northern Spotted Owl and 44 proposed federal timber sales in southwest Oregon. In May 1992 -- for the first time in history -- the cabinet-level committee selected economic interests over the survival of a species. While the proceedings ostensibly focused on the owl and a limited number of timber sales, the controversy was a microcosm of a much larger debate concerning the fate of the Pacific Northwest's old growth forests and the Endangered Species Act. The story-behind-the-story -- as told in surprisingly candid interviews with President Bush's cabinet members, their staff, witnesses, lawyers and people in rural communities in Oregon -- is a fascinating cautionary tale for generations to come. "The film gives invaluable insight into the ethical and political dilemmas facing those who make decisions regarding endangered species protection in our country." "This beautifully-made film captures the essence not only of the spotted owl controversy, but of natural resource conflicts everywhere. The balanced presentation - featuring insightful interviews with mill workers, scientists, economists, lawyers and policymakers - serves as an excellent starting point for discussion of the ecological, economic, social and political issues that will continue to challenge humankind as resources become scarcer and demand grows." "Very impressive -- stunning nature photography, a great political story, and some rare candor from the officials in those interviews." "An excellent documentary showing the issue from all sides and exposing the political influence on the committee...Highly recommended for activists and for high school and college classes." "Classes across the curriculum will be enriched with use of this outstanding, fairly presented video."